This unknown 45 is proof once again that soul music is all about the power of emotion rather than studios full of musicians or technical tricks. To call this a simple - even home-made - production would not be out of place at all. I can only distinguish 4 instruments - 2 guitars, bass and drums - behind Claudette, and a producer with more time or money would surely have asked for other takes to try and overcome the obvious difficulties they get into during the song. But despite these limitations Beauty is very effective due to the emphasis this very simplicity places on Claudette's heartfelt interpretation of her own lyric. S & H were based in the unfashionable city of Cleveland Ohio and the only other 45 I have on the label comes from bluesman Gene Allison - although judging by the catalogue numbers there may well be other releases. I would think that this was cut in the early 60s but the down home nature of the track makes this an absolute guess. 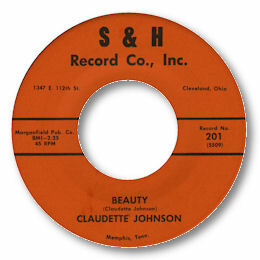 As for Claudette Johnson I know nothing about her whatsoever and have no other recordings by her. Can anyone help with more information about this little jewel of a record?